These systems turn waste into the organic compost that your plants crave while reducing landfill impact. Which method is best for you? Read on. The perfect size for families that generate 2-3 bags of material monthly. 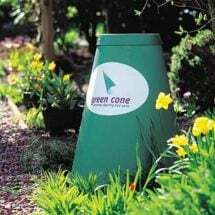 This is the most common, most familiar composting system around. It’s what most people mean when they say they have compost. Most use bins, though some (usually those with plenty of space and not too many raccoons in the vicinity) just pile everything up into a great heap on the ground. If you go with a bin, the biggest choices are how many compartments you want your bin to have, what material you prefer, and whether you want to buy or build it. One-bin systems, which can be either permanent or moveable, have at least two things going for them: they’re simple and they don’t take up much space. With permanent ones, people usually toss stuff on top and pull compost out from underneath without bothering to turn it. (Certain types of bin make this easier.) Moveable bins are built light, so when it’s time to turn the pile, you can just lift it up, set it down beside the pile, and fork the pile back in, bottom to top. Multi-chamber bins make it possible to have several piles going, at different stages. 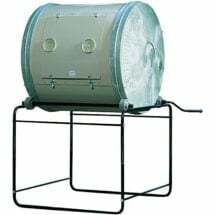 This can be an advantage whether you’re going for cool or for hot composting. 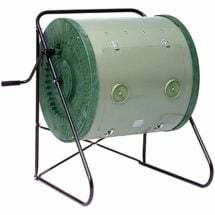 No need for a pitchfork when you use a compost tumbler. Turning by spinning or cranking keeps the pile fired up by allowing more oxygen to reach the decomposing materials. Done correctly, a rotating bin can cut months from the process — sometimes as little as three weeks! In spite of the emphasis on aeration, it is indeed possible to compost underground. These methods have the distinct advantage of being virtually invisible. For example, trench composting involves burying compost in a long trench right in the garden, then planting on top of it. Since composting microbes require nitrogen, which is unavailable to plants for as long as the microbes are using it, some prefer to let the trench sit for a year before planting over it. Other underground methods include composting in underground bins, or simply building the heap in a large hole. 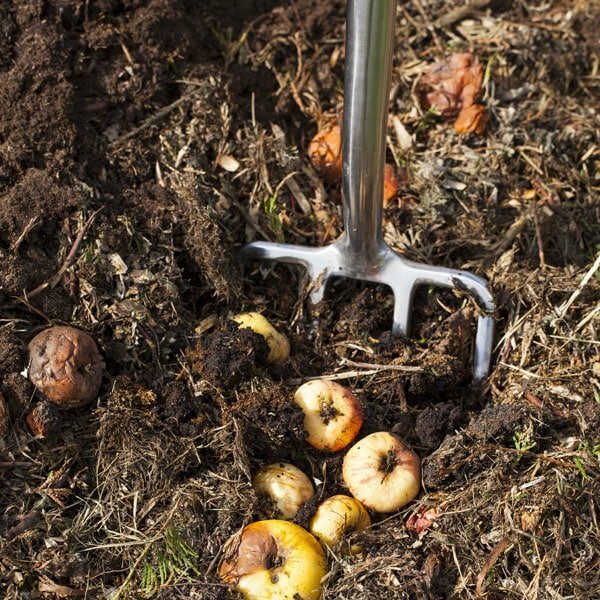 These methods keep the composting process largely out of sight, and they can make maintenance easier for some. Material can be composted in the garden itself in several ways: by building a traditional pile, either hot or cold (In-Situ Garden Piles), spreading it over the plot (Sheet Composting) or burying it alongside rows (Trench Composting). If the bulk of your compostable material comes from the garden, these methods make a lot of sense. But if your first goal with a compost pile is to get rid of your kitchen scraps, then it might not. It all depends how far away the garden is and what will actually work — especially in the dead of winter. Digesters are enclosed or nearly enclosed systems that reduce organic material to mush. Some involve bins perched just above ground but open to some extent at the bottom. Some are partly buried. Most are anaerobic, but one Swiss product — The Green Cone Digester — is aerobic. Unlike the open-air methods described above, digesters can deal with dairy and meat products. Some can break down pet wastes, though instructions always warn that the compost from this process should never be used on a vegetable garden. However, none can handle large quantities of mixed yard waste. A large (drum-sized) anaerobic system can deal with grass clippings and some weeds, but hedge trimmings that would be fine in an open-air pile are too woody for a digester. Indoor methods can be remarkably handy, especially in the winter. Though no indoor method can handle the bulk of material that a pile can absorb, they can all process surprising amounts of kitchen waste in surprisingly short periods of time. Even better, none of these systems requires much attention or oversight. Worms don’t need to be fed regularly (they eat their bedding between feedings) and that bedding doesn’t need to be changed more than four times a year, max. Once a Bokashi bin is full, the only attention it needs is to have its high-nutrient leachate drawn off every other day. By far the best known, most popular indoor composting method, vermicomposting takes up little space and produces perhaps the best compost known to man, woman, beast or worm. Most gardeners know that worms are a sign of healthy soil, in part because their castings (perhaps worms are considered too small to produce manure) contain higher concentrations of nutrients than do other forms of compost which are less likely to wash away because they’re encased and imbued with a slightly sticky, water-resisting mucus. 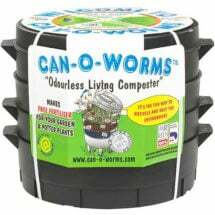 Made from 100% recycled material, the Can O Worms provides a quick, odorless and space efficient way to convert kitchen scraps into rich, crumbly vermicompost. Contains 3 large capacity working trays — no need to purchase additional trays! Includes a coco-brick, to be used as starter bedding, and a handy “how-to” booklet. Roughly 1,000 Red Wigglers are all you need to get started. This is an odorless, space-efficient technique. 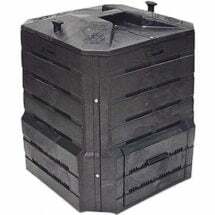 A worm compost bin can fit on or under a table in your basement or even kitchen. The worms do require more regular care than does an outside pile. If you go away for two weeks in summer, a hot pile might cool down. But merely turning it will restore it to all its glory. Worms, on the other hand, will die and you’ll need to dispose of the mess and start over again. This method requires a slight investment; not any old worm will do. But carefully maintained, the bin should last for years. 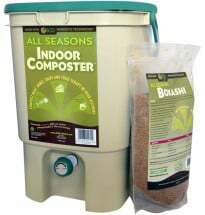 Like vermicomposting, Bokashi can be done inside in a relatively small container. Bokashi, however, uses a substance — usually some form of bran or chaff — inoculated with micro-organisms to decompose organic substances anaerobically. Like all anaerobic composting, it produces a good deal of liquid and a rather smelly but thoroughly decayed soup. The great advantage of this method is that it can decompose anything including the dairy and animal wastes that are banned from other types. The method itself is simple: Each day, drop your kitchen waste into the bin and stir it up with enough Bokashi (the inoculated bran) to coat it thoroughly. Cover it with another handful of Bokashi and repeat this process until the bin is full. Seal the bin with a tightly fitting lid and set it aside for about two weeks, ignoring it except to remove the liquid from the bottom of the bin. (The spigot on an official Bokashi Bucket makes this very easy.) After ten to fourteen days, the bin’s contents can be buried either in the earth or in a compost pile. In another month, it is fully broken down. As for the rhododendron and holly leaves, you can definitely put them in your compost pile. However, it is a good idea to really chop or shred them up, as they take much longer to break down due to their fibrous and waxy make up. It really depends on how quickly you are trying to create usable compost. It might be a good idea to have a separate pile going that you incorporate those leaves into and another pile that you do not. That way you can have a pile you know will rapidly break down into garden goodness and have yet another ready to use later on. Good luck! 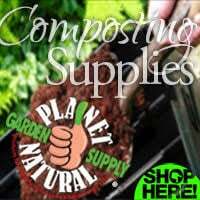 Can I compost diseased plants? There is an active ingredient in citrus call "limonene" that has the potential to kill your worms if added to your pile in large concentrations. For a small home wormery I would recommend adding citrus peels 1 at a time and wait until it is thoroughly decomposed before adding more. Suitable for recycling many types of food waste including meat, fish and dairy products. Efficient and affordable, SoilSaver features an award-winning design. NO turning! Uses beneficial bacteria to quickly ferment table scraps. Made for serious gardeners that gather 5-6 trash bags of material monthly.